Here’s a chance to receive a personalized letter from an author that can be inserted inside a print edition of the book that you are giving over the holidays or added into a card announcing an ebook purchase. “To (recipient,) autographed at the request of (Your Name) Best Wishes, Pete Earley” will make one of my books unique as a gift. Purchase a book from your favorite retailer and use the form below on this blog to notify me. Quicker than you can say Ho, Ho Ho, the letter is on its way. But you must fill out the form before December 15th to guarantee delivery and this offer is limited to the first 100 email requests. Whether you enjoy fiction or non-fiction, there’s a Pete Earley book that will fit on your list. Thank you for your support! An audio sample of Duplicity, my newest novel. Sent to inspect a Pakistan prison for human rights violations, NGO Attorney Christopher King encounters a bribe-seeking warden and becomes entrapped in a Taliban attack in this short audio snippet from DUPLICITY, my new action/suspense novel co-authored with former House Speaker Newt Gingrich. My newest, DUPLICITY is the first in a two-book series that Speaker Gingrich and I are writing that features two heroic Marines — Capt. Brooke Grant, a African American military attache, and Sgt. Walks Many Miles, a Crow Indian embassy guard, in a battle against The Falcon, a charismatic terrorist forging an alliance between radical jihadist factions in Africa. It’s been described as a House of Cards and Jason Bourne thriller. If you prefer non-fiction, consider RESILIENCE: TWO SISTERS AND A STORY OF MENTAL ILLNESS, the autobiography that I helped Jessie Close write about her recovery from mental illness and addictions. Jessie speaks frankly about her bipolar disorder, suicide attempts, failed marriages and the resilience that eventually led to her healing and recovery in this lively, witty and poignant book that includes vignettes by her famous actress sister, Glenn Close. 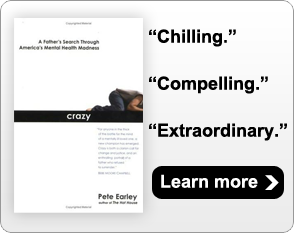 You can delve deeper into mental health issues in CRAZY: A FATHER’S SEARCH THROUGH AMERICA’S MENTAL HEALTH MADNESS, the nonfiction account of my son’s illness, his arrest and my investigation into the inappropriate jailing of persons with mental illnesses in our jails and prisons. 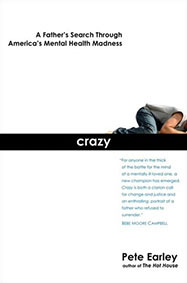 One of two finalists for the 2007 Pulitzer Prize, CRAZY (which refers to our mental health system, not individuals with mental illnesses) explains how jails and prisons have become our asylums in shocking details that, unfortunately, still can be found in many jails and prisons in our nation. It helped sound a call for action across the nation and led to me becoming an advocate for reform. Speaking of jails and prisons, THE HOT HOUSE: LIFE INSIDE LEAVENWORTH PRISON, my eyewitness account of everyday life inside a maximum security federal prison continues to be my best selling book. Described as a “white knuckle tour of hell” by Kirkus Reviews, it shines a spotlight into a troubled world few ever see. And if you are still searching, check out, CIRCUMSTANTIAL EVIDENCE: DEATH, LIFE AND JUSTICE IN A SOUTHERN TOWN. It describes the wrongful conviction of Johnny D. McMillian, a black man in Monroeville, Alabama, for the killing of a white teenage girl. Monroeville was the inspiration for Harper Lee’s fictional masterpiece, To Kill A Mockingbird, and my book has attracted new attention because of the recent release of JUST MERCY, a powerful account written by Bryan Stevenson, that highlights the Monroeville case. Stevenson is the brilliant and tireless attorney who freed McMillian from death row. Use this form to tell me which book you bought and the name of the recipient and I’ll mail a letter to you to include in the book. But this offer ends December 15th at midnight and is limited to the first 100 requests. The address where the personalized letter will be sent. U.S. addresses only, please. Used only to send you a copy of your message and to get in touch in case there are additional questions. You will not be put on a mailing list. Select which book the letter will be paired with. If you want a certain message included or have any other comments to make before Pete writes your letter, please let him know here.